Rob Rainwater is a prolific songwriter, a masterful guitarist and mandolinist, a session musician, a music teacher, and at times, a bit of a stand-up comic once he takes the stage. Drawing on a background steeped in blues, folk, classic rock, and bluegrass, Rob creates a rich mix of originals and classic blues and rock covers. His songwriting comes from the heart, telling both autobiographical and fictional accounts of a man who emerged from a battered beginning and fought internally to discover his source of joy and hope as an adult. Rob is a man who has earned his right to sing the blues, and he can wail with the best of them. Then in the next turn, he'll share a song that points to a silver lining, a lesson learned, a truth accepted. Rob is a genuine people-person, a tender-hearted creative, and his passion is to express his experience through music and hear others' stories, too. Based out of Portland, Oregon, Rob performs as a solo act, with the Rob Rainwater band, and in a popular singer/songwriter duo act called The Whiskey Darlings (a collaboration with local artist Michele Van Kleef). 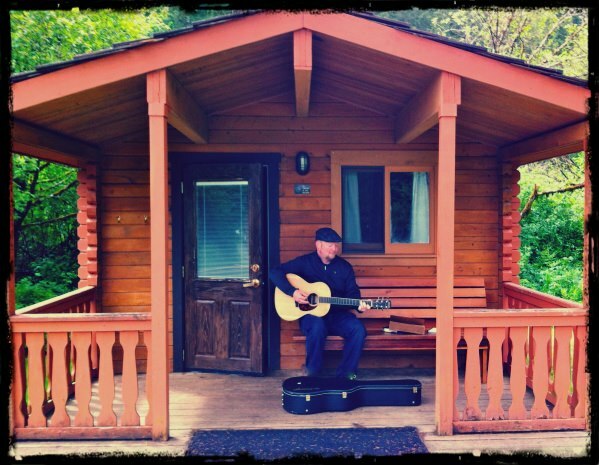 He entertains audiences at venues throughout the Pacific Northwest, including festivals, summer park concerts, wineries, restaurants, weddings, and private parties. Rob loves the magic of live performance, and the interaction with his audience. Additionally, Rob has played live and recorded with many outstanding artists including Scott Brockett, Andrew Paul Woodworth, Tyler Stenson, Jean Pierre-Garau, Carl Smith, Steve Hale, Norman Sylvester, Amber Sweeney, Redwood Son, John Rankin, and Phil Hyun. In 2013, Rob released a solo album titled "About : Time." In the same year, his songwriting debuted nationally in a film called "Welcome to Inspiration." In 2014, Rob's music was featured in the Fertile Ground Festival's world premiere of "Remme's Run." In 2015, Rob's duo project known as The Whiskey Darlings released its first album, "Live Sessions." In 2016, The Whiskey Darlings released a holiday album called "Christmas Songs." Rob is currently in pre-production for his sophomore album (to be released in 2018). The Whiskey Darlings will also be releasing its third album in spring 2018. Rob's radio show "Songs from the Source" is now retired, but past shows are available to stream. "Songs from the Source" focused on the art of songwriting, the creative process, and what inspires artists in their creative work. The show regularly featured interviews and live performances with Pacific Northwest songwriters. To hear past interviews, click on the artist's name: Tyler Stenson, Teresa Topaz, Jason Fellman, Holly Ann, Jean-Pierre Garau, Laurie Hughes, Stephanie Schneiderman, Geoff Metts, Kelly Jones, The Junebugs, Steve Hale, Common Dear, Ellen Whyte, Brian Odell, John Rankin, Michele Van Kleef, Rae Gordon, Mike Collins, The Sale, Terry Robb, Kevin Selfe, Cary Samsel, The Get Ahead, Norman Sylvester, Sean-Michael Berahmand, Andrew Paul Woodworth, Michael Allen Harrison, Ara Lee, Naomi Tatsuoka, and Redray Frazier.